What’s with all the skulls? I see them everywhere. The images signify our current apocalyptic culture. Doom stares me down all over town through empty sockets. Beneath a few layers of skin and whatever wig weave we’re sporting, or not sporting, we’re all walking and talking skulls supported by skeletons. I continue to contemplate what the message and symbolism of all this skullduggery could be. 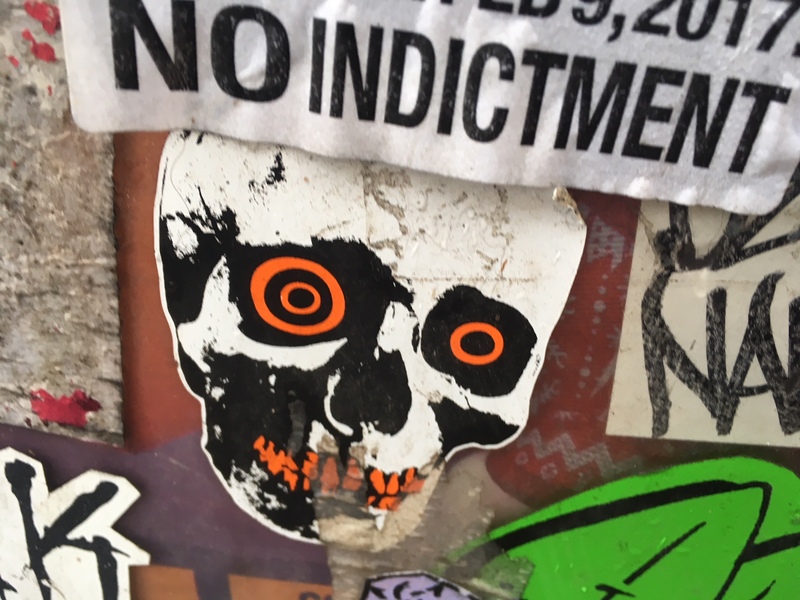 For part of the decoration of the Art Car known as the Space Taxi, an unknown artist included swirling eyes on a skull. 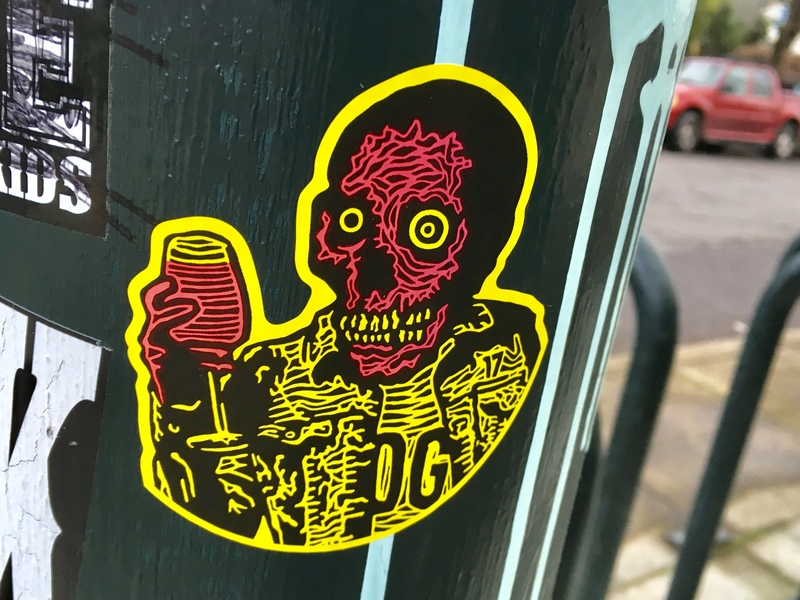 Most of us are aware that eyes will dissolve right out of their sockets as we decompose but these artistic liberties pay off with an artier image. 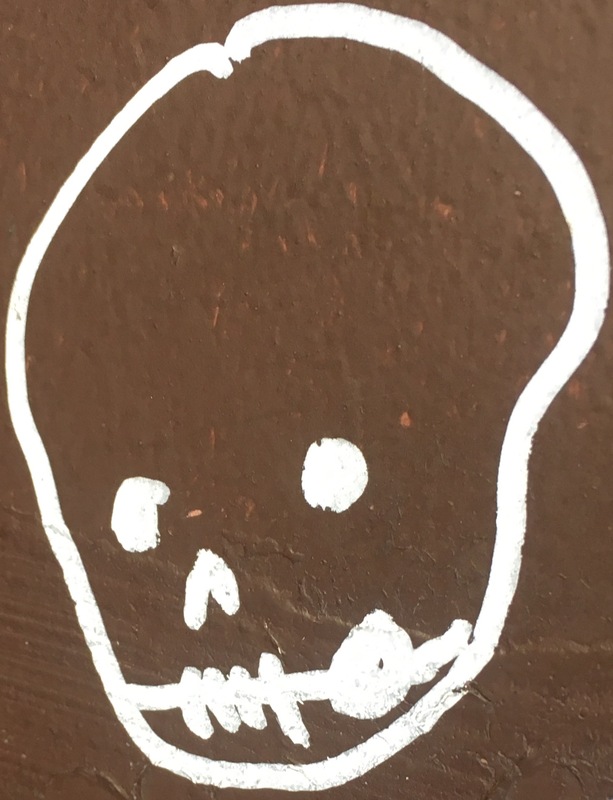 Rough looking skulls take on the appearance of head bones that have been kicked around a while or stacked up in catacombs for centuries, especially when they look like they’ve been painted with white out. It’s was the subtle placement on an East Central Industrial area furniture store doorway that caught my still intact eye. Hyper realist (look at those teeth!) 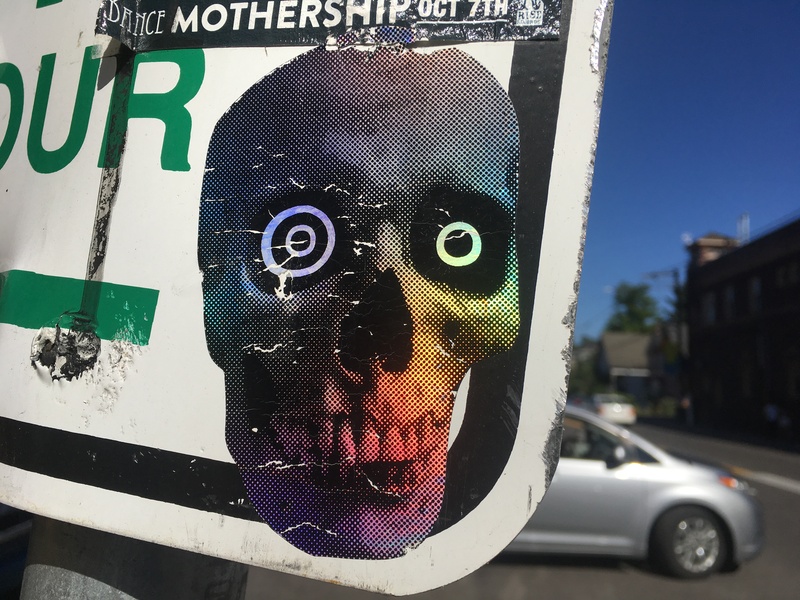 and reflective, this sticker creation seen on SE Hawthorne Boulevard has the added bonus of taking on different colors depending on the viewing angle. This Day of the Dead image that includes a key hole in the forehead has the look of being mass-produced but it seems like an ornate way to cover a spare tire. 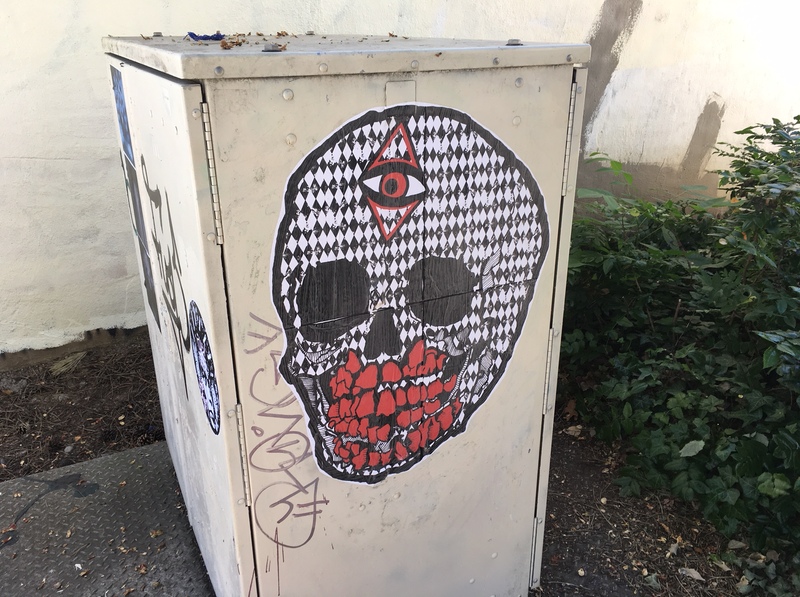 A skull with a third eye and four rows of teeth transforms this transformer box on SE Division Street into a roadside Skull Art kiosk. 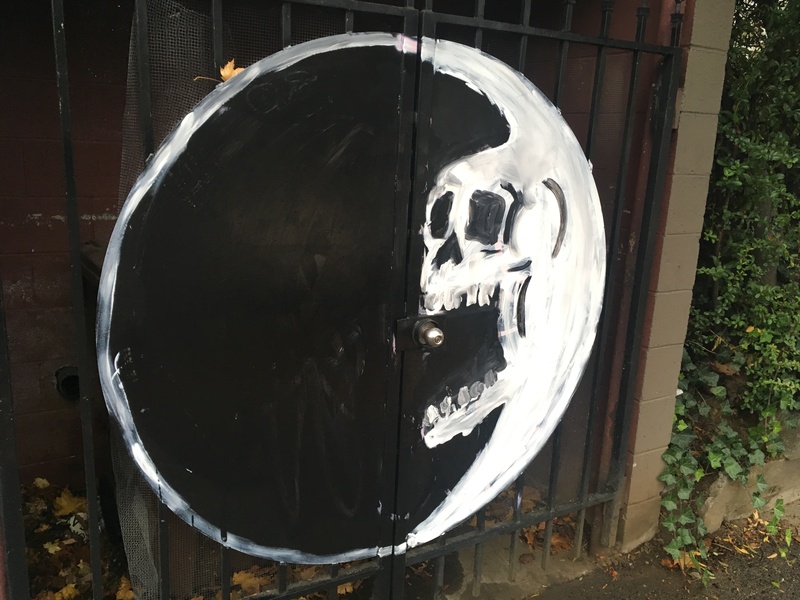 A temporary memorial, it’s since been painted over, sprung up around the time of Fred Cole’s passing on a metal door gate on N Albina Street. I didn’t realize it was a Dead Moon album cover reference at first. 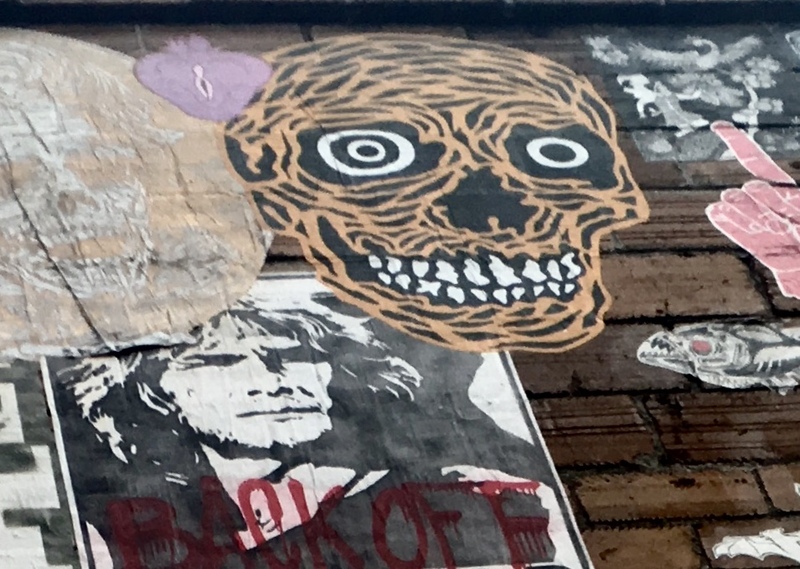 Some street skulls have significance. It’s a shame this one didn’t get a chance to live on. 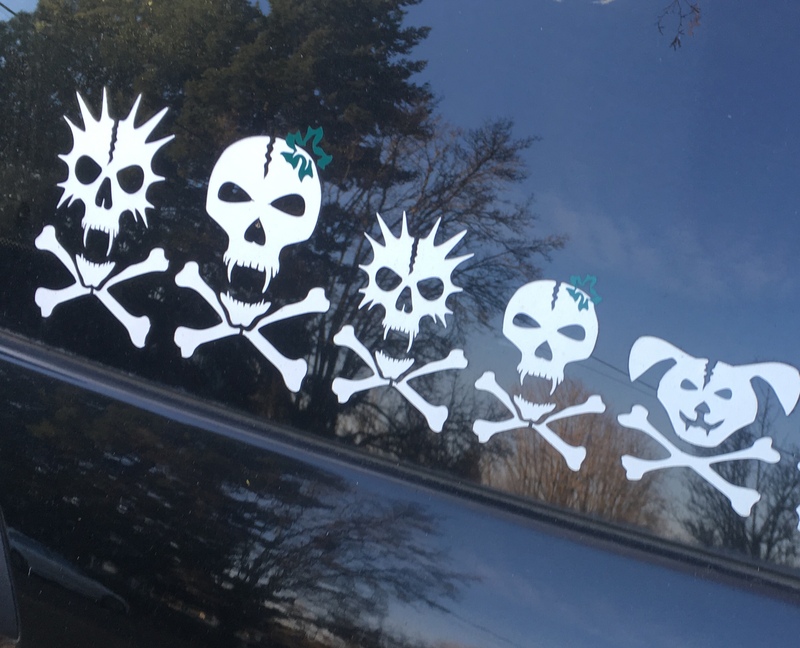 Annoying family stickers get the skull treatment which is way less annoying yet still annoying in that family sticker on back windshield of a car way proving that skulls can’t make everything cool. 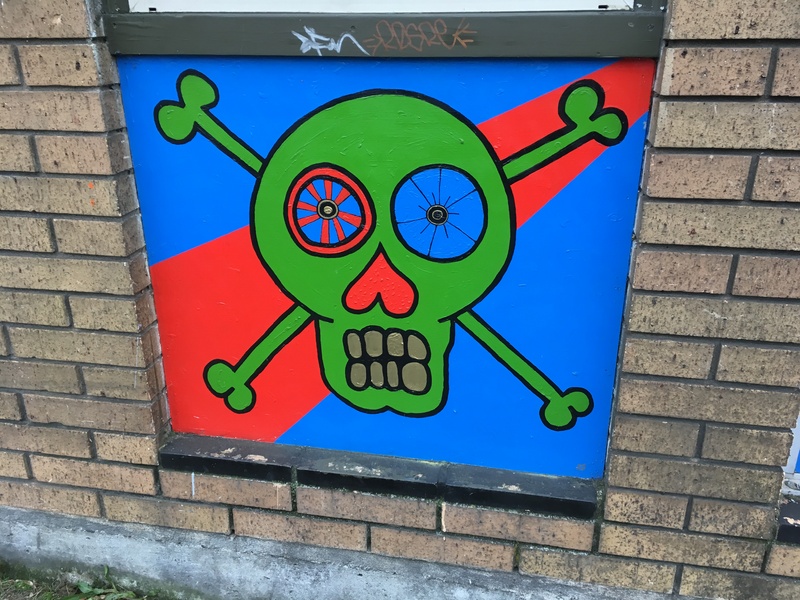 The colors are vibrant, the eye sockets look like bike tires and while it’s more skull and crossbones than solo skull, the psychedelic, folk art nature of this piece seen on Hawthorne Boulevard knocks my socks off. 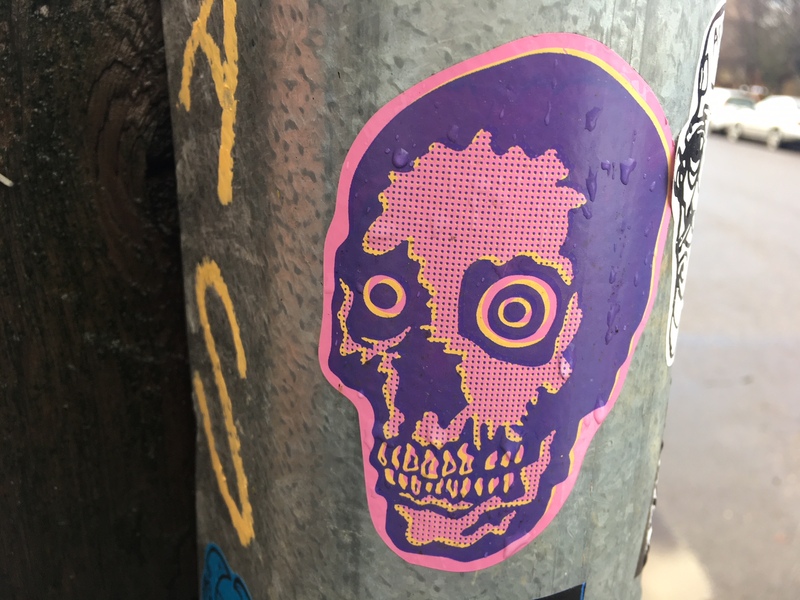 There’s skull branding going on, especially with the design in the eye socket that you’ll see in various incarnations all over town. This one was spotted in the Hawthorne shopping district. Hoisting wine and wearing a classy shirt makes for one stylish skull. I’m not sure what he’s selling besides an upper crusty life style for the after world. Whatever else it is, I’m buying in. 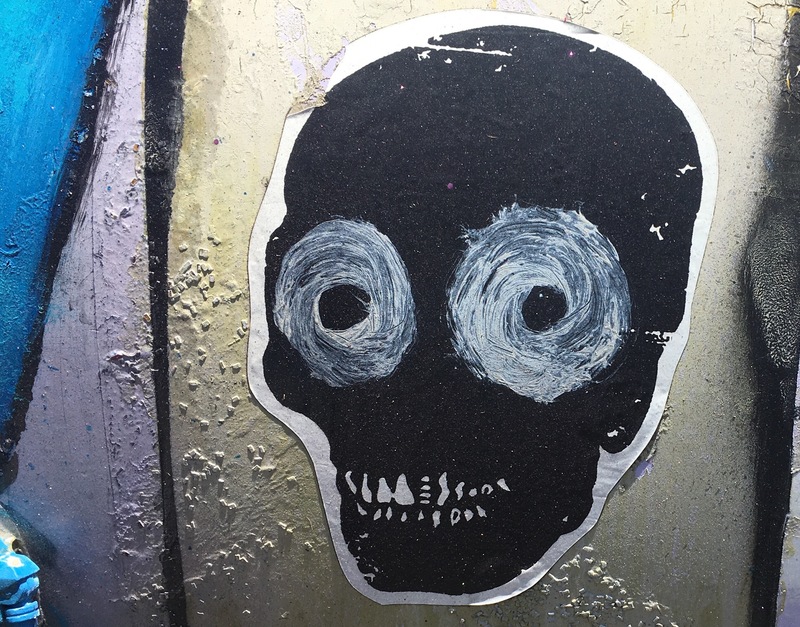 The Mississippi neighborhood has so many skull images up and down the street that you’d think there was a morgue in the basement of one of the buildings. It may be the skull capital of the city it wasn’t already the name of a state. 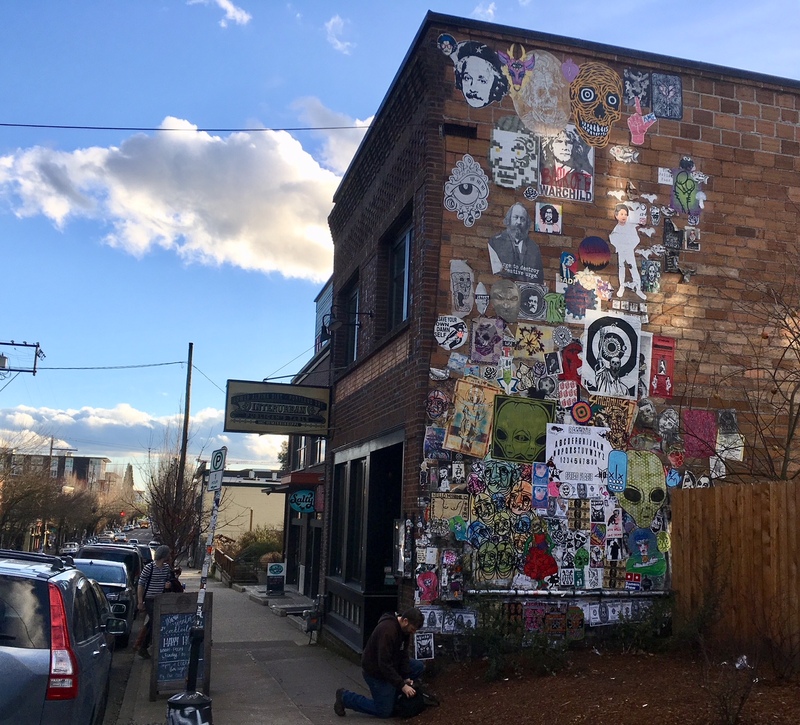 The whole side of a building has been taken over by various skull images on N. Mississippi Avenue. 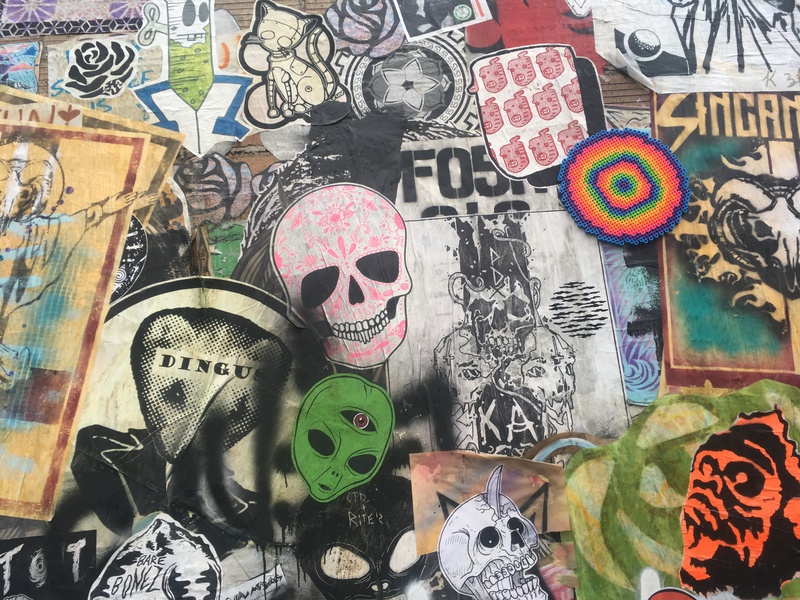 Another view of various skulls mixed in with other cultural referencing forms of street art. 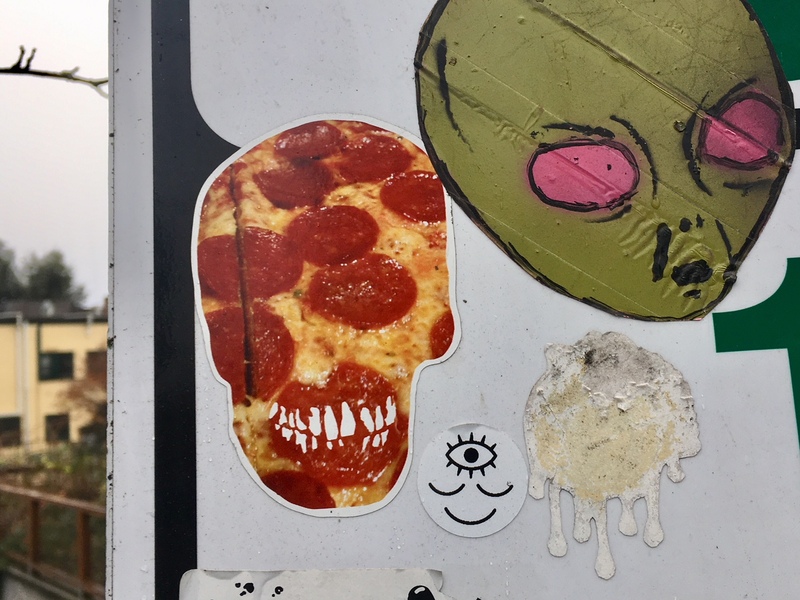 A pizza skull has to be the greatest skull design ever conceived. I can’t see it selling pizza but it looks delicious. 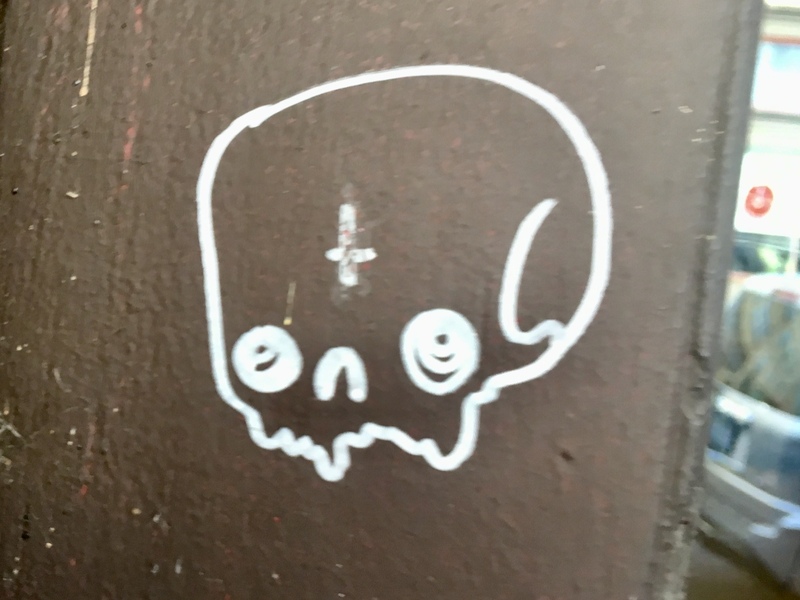 There’s something in these two designs found in the Mississippi neighborhood that screams evil eye skull. I like the colors and the hypnotic skull sockets additions. The variations are sure to lull people into a sense of uneasy satisfaction which happens to be my current state of mind being surrounded by skull imagery. The last 5 skulls, including pizza skull, are all done by Arrex Skulls. He does lots of screenprinting for other artists. He’s in PDX, too, surprise! I picked up on a theme there and had to figure it was the same person. I like that all the skulls are different looking but have the similar socket design. You’re now an honorary member of our research department. Hells yeah, thanks. My skull obsession isn’t quite where it should be but it’s fun to see them all over the place. I gotta get back to portland so I can add my skullz to the mix.